Getting a correct perspective is not just about putting out convergence points and perspective guidelines. The properties of the "camera" can be handeled by knowing how they are affected by the position of the convergence points. Using a grid of linear perspective, an illusion of depth can be created. Basically it is a model of a camera in a virtual space. This camera have properties like position, direction and field of view (the angle from left to right in the image). By positioning perspective grids with convergence points one defines these properties without really knowing them. 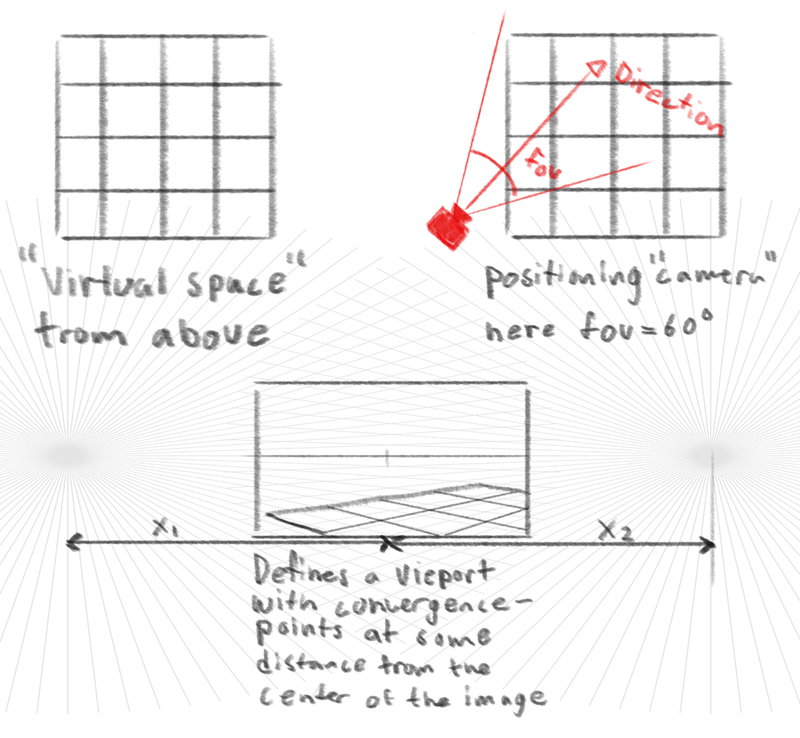 By positioning perspective grids with convergence points, a camera and a linear space is defined. It is easiest to imagine the camera stationary and directed upward (seen from above in orthographic view) and have the "world" with all the objects rotate relative to it. Dividing the field of view in smaller segments results in guidelines which can be used in the drawing. Dividing the image and the camera in the same segments makes it easier to plot the position of the objects in the scene. Where α is the rotation of the box and θ is the field of view. With α = 67° and θ = 90°; x = 0.42 is obtained. The formula is created so that x = 0 is in the center of the image and x = 1 is on the right border. In this case the first vanishing point will be positioned somewhere between the 4:th and the 5:th segment line in the image. To find the second vanishing point, 90° is added to α (since the box is of right angles). Then x =-2.35, which is somewhere outside the image on the left, is obtained. The position of the convergence points obtained. This whole idea can be used the same way for vertical rotations as well; This will introduce another convergence point. The problem with that however is that the field of view of the camera seen from above in orthographic view no longer will be correct if the camera is rotated vertically. It only is if the camera is standing horisontally, which follows if the horizon is in the center of the image. Minor vertical rotations (where the horizon is still in the image) will not result in big changes in the angle seen from above and the orthographic view can still be used to show the angles. It gets trickier if the vertical rotation gets bigger. This tool can also be used to get an understanding of perspective for illustrations and drawings without doing any calculations. When sketching a scene in free hand these ideas are useful for visualization without having to go through the technicalities. Knowing that the relationship of distance between convergence points and direction of the camera is not linear is useful. 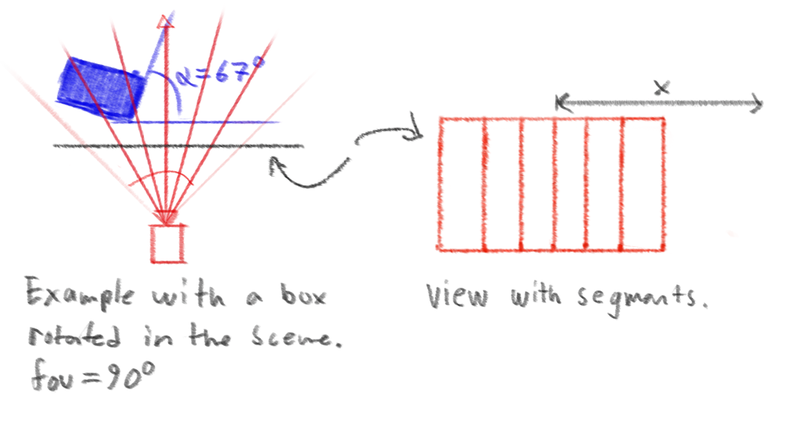 This also shows that having two convergence points (of 90° angular shift) inside of the frame of a drawing will result in a unrealisticly big field of view (bigger than 90°), which can make the perspective look weird when using linear perspective. Normal camera lenses have a field of view of around 40°. The formula could be inverted to calculate the field of view of the camera of a photograph or a drawing.